Denali National Park is the kind of place that sparks the imagination of travelers. Within its borders are the iconic images people associate with a trip to the Great Land: grizzly bears catching salmon from a rushing river, the imposing snow-covered Denali mountain, and six million acres of nearly untouched, pristine wilderness as far as the eye can see. With more than 530,000 visitors in 2014, Denali has become the number one most visited national park in the Last Frontier. As we complete our series on the most popular national parks in Alaska, we’ll tell you why Denali is a can’t-miss place. 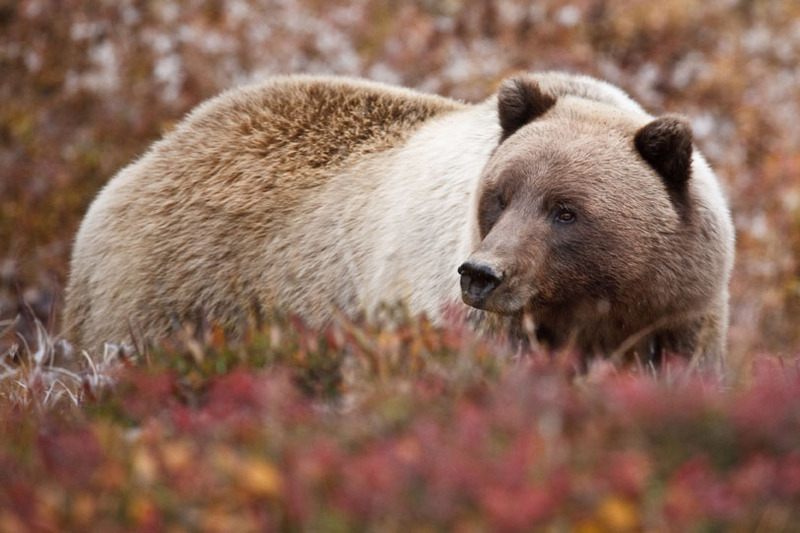 Denali National Park is a self-contained sub-Arctic ecosystem, home to 39 types of mammals including the Big Five – grizzly bears, moose, caribou, wolves and Dall sheep. It’s possible to see all five on a drive along the 92-mile road through the park. More than 160 species of birds live in or migrate through the park. Avid birders can check a seasonal listing to see which birds they might cross off their checklists during their visit. The skyline is dominated by North America’s tallest peak, Denali (formerly known as Mt. McKinley), which towers over the park at 20,310 feet. Neighboring mountains of the Alaska Range are covered by glaciers. Its landscape features boreal forests and sub-Arctic tundra. Geology buffs will enjoy evidence of the park’s volcanic history, such as pillow basalt formations near the Eielson Visitor Center. The park is home to two of North America’s oldest archaeological sites, 12,500 and 13,000 years old, showing evidence of human migration during the last Ice Age. It also contains a number of historical structures, such as cabins from the Gold Rush era. The park maintains and protects ethnographic resources, or sites and natural features that are important to cultural groups today. Denali National Park is an excellent place to witness Alaska’s famous Northern lights, also known as aurora borealis. This phenomenon occurs when solar particles interact with the Earth’s atmosphere, creating flowing sheets of color. They are best seen in the fall-to-spring months when there are fewer hours of daylight, giving you a perfect reason to visit Denali in the off-season. Your experience of Denali National Park depends on your interests and preferred activity level. Mountain climbers will enjoy visiting the south side of Denali, which is filled with challenging peaks. Backcountry hiking and camping are available by permit. If you’d just like to do a little day hiking, some trails are accessible from the Denali Visitor Center. Or hop on a green shuttle bus into the park in the morning and take another one back to the Wilderness Access Center later that day. In the summer months, the winding park road provides an easy way to tour the north side of the park, enjoy its unparalleled scenery and watch for wildlife. But cars are prohibited on the road beyond the Savage River at mile 15, so you’ll have to proceed on foot, by bicycle or by bus. Taking a guided bus tour (not the same as the green shuttle bus) is often the best way to go – plus it lets you keep your hands free for photography. Some tours into the park combine sightseeing with activities. Princess offers numerous activities in Denali including ATV adventures, jet boat safaris, flightseeing adventures and family tours such as a visit to an Alaskan homestead that raises sled dogs or a covered wagon tour with backcountry dining. The park is accessible driving north from Anchorage or south from Fairbanks. You can also take a Denali train tour that leaves from either city and includes stays at either the Denali Princess Wilderness Lodge or the Mt. McKinley Princess Wilderness Lodge. Each lodge has knowledgeable staff available to help you book day trips into Denali, ensuring your visit to this popular Alaska national park is as unforgettable as you’ve dreamed.